Last time I was down 7 years ago, I wanted to do an inventory of all the strange vehicles on station. 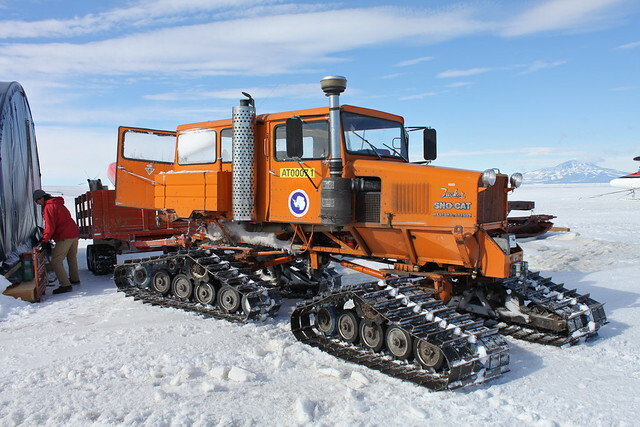 I didn’t remember that I wanted to do that until just a few minutes ago when a friend back home asked me about the how a Pisten Bully–hereafter referred to as a PB as we do on station–differs from a Sno-Cat. Of course the Ice does strange things to your memory, but I’m going to blame this on the intervening years and age. Now I think I’m going to go over some of my favorite vehicles and add others as I run across them. To answer his question about the difference between a PB and a Sno-Cat, they are very similar. 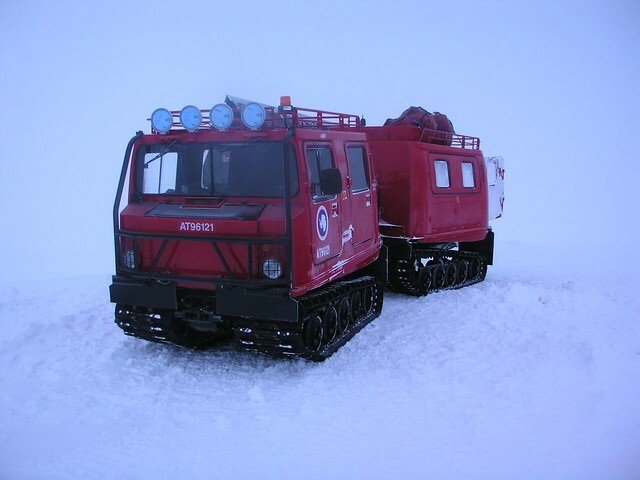 The are both built for high grades, snow, can be equipped with a blade, and can carry passengers. 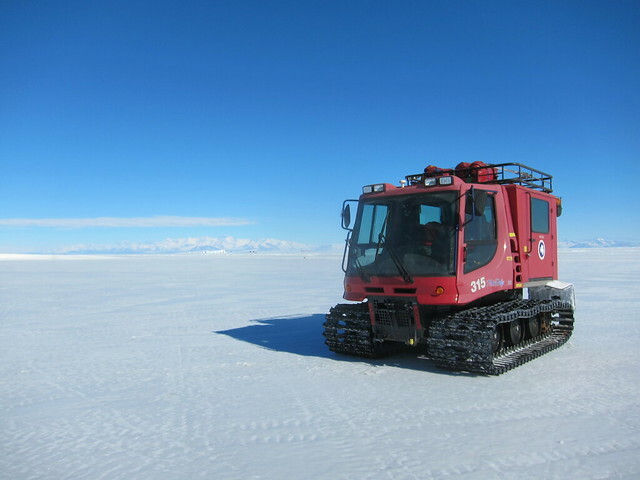 We have several Tucker Sno-Cats here on the base and throughout the continent (image right). We also have a plethora of PBs on station. Having now driven a PB (image left), I’m keen to drive a tank. It would be interesting to compare how similar the tracks are. Oddly, having also driven my grandfather’s small Cat tracked bulldozer, it’s entirely different than what I expected. My grandfather’s Cat was steered by foot, the PB is a fairly normal steering wheel. The PB a bit eccentric though as it’s hydrostatic so there’s gas pedal and an additional dial on the steering wheel that is a gear equivalent. It’s also slooowww… but steady. I think it’s top speed is 15 mph, if that. I’m somewhat split between the PB and the Hagglund though. We are using both a PB and a Hagglund for Search and Rescue this year, and the Hagglund is our primary vehicle (image right). More specifically known as a Double Hagglund or a Bandvagn 206, it’s another tracked vehicle that’s very easy to drive as it’s just like normal vehicles. That’s where the similarities end though, as it too is built for grades and snow. It’s also designed to move over rough ground though. Designed in Sweden, it’s also has military variants. It has two cabs and articulates in between the two of them. Wear your ear protection though as it’s not a peaceful ride. Of course one of the other vehicles that is beloved by all is Ivan the Terra Bus (image left). 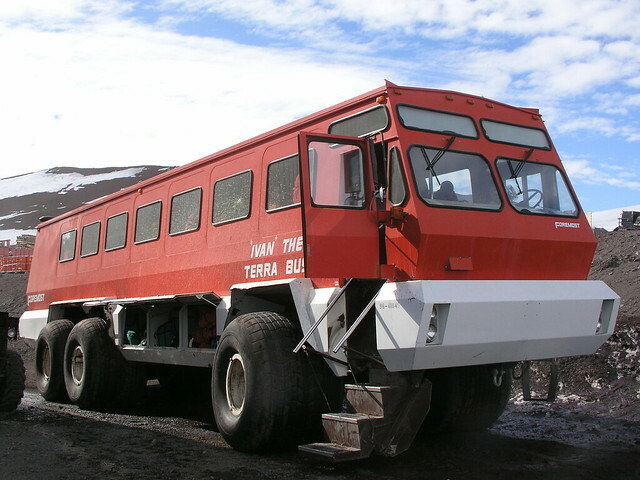 Made by Foremost–a Canadian company–it’s most often used for transporting up to 56 passengers to and from one of the three runways near McMurdo. The use Terra Buses in other Arctic climates as well, but I doubt they are as beloved. Especially now that it’s got competition, although we avidly debate the asine background of his competition. I’m relating the story as I understand it, so understand this is from the rumor mill. They were looking to augment and probably replace Ivan so they put a request out and put it through the bidding process. Kress bid and won the contract on some criteria, perhaps the lowest bidder, and then proceed to create and build a one off articulated vehicle. From the start it was fubar’ed. When it was delivered on vessel the tires had to be shaved so it could fit across the bridge from the Ice Pier (just this year we got new ones to replaced the shaved ones). I seem to remember this being followed by major mechanical issues (as this was tested in Kansas, as if that’s similar to Antarctica). Then they realized that even with articulation it was too wide to turn in town, so they had to move power poles (and the power lines on them), to allow it to go through town. Sometime after that they found out you can’t turn the heater on in the back as it can cause carbon monoxide poisoning, as it’s too air tight. Having ridden in this thing, I can tell you it's a sea sickening ride. It absolutely feels like they put a box on top of a flatbed truck without air-ride and sold it for several hundred thousand. All this for an extra 3 passengers, when they should have gone out and bought another Terra Bus. Nothing we can do about it now, we have two tractors, two flat beds, and a passenger module. If they retired Ivan though, I think people might revolt. Oh and it's known as Clifford the Big Red Truck (above image right). More to come as I get time to research and ask about the different vehicles on station. We have a new one that’s taking the place of the PB on our Traverses which sounds interesting. I would also like to write about the Deltas, Nodwells, Mattracks, and maybe some of the aircraft we get. Thanks to Sandwich and Eli for there Creative Commons photos.